They say breakfast is the most important meal of the day. It’s cheesy, but true. My roommate even said he’d skip a shower before he would skip breakfast. The sad thing is, how many of us will take the time to do everything else BUT eat breakfast? Yes, I am guilty of stopping at Starbucks on the way to work to grab breakfast (reduced fat turkey bacon and egg white sandwich is the lowest WW point item on the menu, ringing in at 8 points). Yes, I am guilty of sometimes skipping breakfast. Yes, I am guilty of arriving to work and getting grossly unhealthy breakfast sandwiches from my work’s cafeteria. BUT. I do my best not to do those things (ok ok, except sometimes I *do* treat myself to Starbucks in the morning). I don’t know about you, but not eating breakfast really negatively affects the rest of my day. On days that I skip breakfast, and then later eat a balanced lunch, I feel ravenous afterward, which then leads me to over eat, pig out, etc. It also messes with me physically, makes me jittery, and my stomach will audibly growl (and that’s not good when I’m constantly surrounded by people at work!). I have been pretty diligent lately on giving myself time to do something as minor as just toasting a whole wheat English muffin before rushing out the door (just don’t judge me by the crumbs in my car – that being said, I need to vacuum it! I hate, hate, hate messy cars). I am great at multi-tasking in the morning, so I’ll pop it in the toaster and then go brush my teeth or take the dog out, so that when I come back all I need to do is spread a little butter over it and grab a napkin. This all being said (and yes, my spiel is coming to a close), I decided to make freezer breakfast sandwiches and burritos. My husband has an even harder time making breakfast in the morning, so this was partially for his benefit. I used two recipes from Skinny Mom’s Kitchen, breakfast sandwiches and breakfast burritos. They are healthier than hitting up the drive thru in the morning, but they are not really healthy overall. These should not be an everyday thing, and should be supplemented with fresh fruit, as well (as we all know, fruit is “free” according to Weight Watchers!). The English muffins in the sandwiches get just a little soggy when microwaved, as they’re not toasted, but they still taste great – next time, I might try toasting them before freezing, and see what happens. The original burrito recipe said to heat for 2.5mins in the microwave, but I only did mine for 2mins, and that was almost too long. The corners were hard/crunchy, because that’s where the tortillas were folded over. However, the original recipe says that, for best results, thaw in the fridge overnight, which I didn’t do. I used one egg for each sandwich, however next time, to lower the point-count, I may use an egg white only (1 egg = 2pts, 1 egg white = 0 points). I used turkey bacon for the burritos, as well, by heating it in a skillet for 5-10mins on medium heat, flipping often), since I didn’t have sausage, and that worked great. Next time I do want to try sausage though! And finally, I apologize for the lack of pictures. I was in a rush while making them (I was doing it while I was waiting for our dinner to marinate), and in the morning, it wouldn’t be very safe for me to snap a picture while eating, while driving…next time, I promise I will take more pix!). -Meanwhile, fry 4 eggs (again, I used cooking spray)…you can either do this by cooking one egg separately, or all together in a large frying pan, if you do it together (which I did), the whites will run together, but once they firm up during cooking, you can break them into 4 parts with a spatula. -Once eggs are cooked, quickly flip and cook for about one more minute (this is better than keeping them “sunny side up” because you don’t want to put a runny egg in the freezer). Sprinkle cheese over them, then take off the heat. 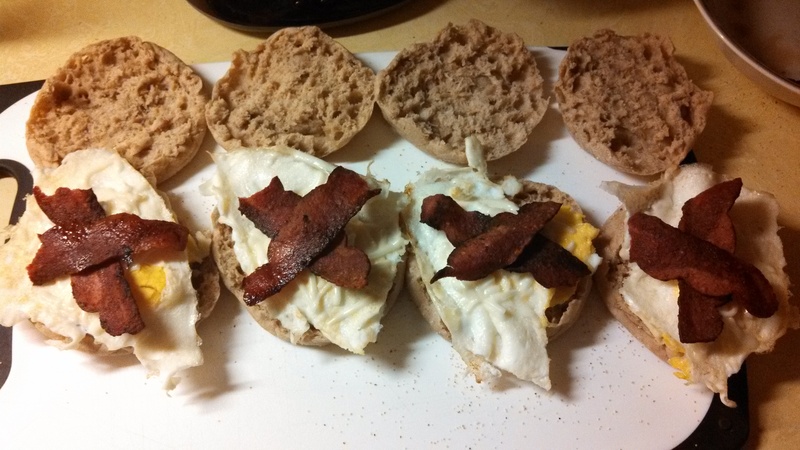 -Assemble sandwiches by placing in order: muffin, egg with cheese, bacon, muffin (or whatever order you want, haha). -Once they are mostly cooled, wrap tightly in plastic wrap and place in the freezer. -To re-heat in the morning, unwrap from plastic wrap, wrap loosely in a paper towel, and microwave for one minute. Check to make sure it’s heated through, as some microwaves can be different. -Fry turkey bacon (see above directions), let cool, and crumble into small pieces. -Combine milk and eggs, stir well, and heat in a frying pan over medium or medium high heat (depends on how fast you want the eggs to cook), add bacon while the eggs are still soup-y (sounds gross, but it’s true, haha). -I added the cheese shortly before the eggs were fully cooked, but the original recipe says to add the cheese at the end. Once eggs are cooked, add the cheese if you haven’t already, and add the salsa. Mix well. -Take off heat and let cool a bit, before assembling the burritos. -To assemble, spoon some of the mixture into the middle of each tortilla, fold in ends, and wrap up. -Once they’re fully cooled, wrap tightly in plastic wrap and place in the freezer. -Follow re-heating instructions based on my above notes. ***I apologize for this post being so WW-heavy, but the reason for this is that I try to have low-point breakfasts and lunches, so I can have more decadent dinners…it’s pretty obvious that I looove to cook! If I have breakfasts and lunches that are unnecessarily high in points, then that affects my dinner. Everyone is different, of course, so whether you are on Weight Watchers or not, adapt this to your own personal needs. ***I posted this on the weekend, because if you want to make a week’s worth of breakfast sandwiches or burritos, you can just take a few minutes today or tomorrow to get it done, and then be set all week! Let me know how these go for you, and the tweaks you made.